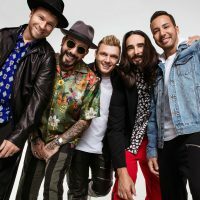 The album from Backstreet Boys, DNA, is available now and last night they stopped by the Tonight Show to chill with Jimmy Fallon. They don’t necessarily sound bad, but their facial expressions suggest they think they sound a lot better individually than they actually do. Personally, I think their voices are seem to be strongest when working together. No wonder none of them either had successful solo careers. Check out their performance of Chances below.